The name Cyrus W. “Doc” Shores may not be found on the list of larger-than-life lawmen whose legends and lore give them top billing in the taming of America’s “wild and woolly West;” yet, in the late 1800s, Doc Shores became known to law officers and the lawless alike – eliciting both fear and respect for a man reputed to be one of the best lawmen of that era. 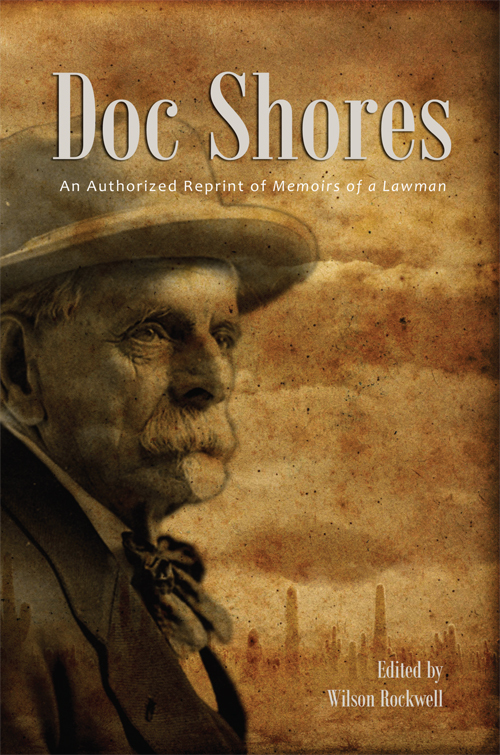 In Doc Shores - an authorized reprint of Memoirs of a Lawman, author Wilson Rockwell reconstructs Shores’ life and experiences from the lawman’s memoirs. He then combines those personal writings with additional research and captures that infamous time when the West was young. This book provides firsthand accounts of outlaw hunting; observations about famous men who Shores knew both inside and outside the law; and descriptive tales about coming west on a “steamer” up the Missouri River to Fort Benton, cattle drives from Texas to Oklahoma, and being a bullwhacker and freighting all over the nation’s new frontier. On August 7, 1999, Wilson Rockwell autographed an original copy of Memoirs of a Lawman as follows: “To my friend David Smith with my appreciation for bringing my books back to life for a new generation of readers.” With a thank you to and authorization from Wilson Rockwell’s son, Daniel, and in memory of Wilson Rockwell, who died in 2007, Western Reflections and its publisher P. David Smith are proud to reprint this timeless work.